The start of the exciting new challenge on the Costa Blanca is here and Torrevieja Tigers RFC urgently need sponsors. Many sponsorship opportunities available at all levels. We also need rugby players of any age, referees, trainers and volunteers to assist in the general running of the Torrevejia sports club based at the 2 million euro Nelson Mandela stadium This was opened in 2010 and has a capacity for around 3,000 spectators. Further information is available from Ian Baker on 650 892 044 or Glyn Horsfall on 617 357 259, via the website just pop along to the club as below. Torrevieja Tigers have their training session on for three groups every Monday, Ladies, the under 12 years and the under 14 years. The training takes place at the Nelson Mandela Stadium, Avenida Delfina, Viudes, Torrevieja, home of the Torrevieja Tigers. The Stadium is approved by the Rugby Union Football Association and has an artificial grass surface. Training takes place between 1700 and 1900 hrs and all are welcome, for further information contact Ian Baker on 650 892 044 or Glyn Horsfall on 617 357 259. Torrevieja Tigers have their training session on for three groups every Tuesday, seniors between 1900 and 2100 hrs, the under 16 years and the under 18 years, between 1730 and 1930 hrs. The training takes place at the Nelson Mandela Stadium, Avenida Delfina, Viudes, Torrevieja, home of the Torrevieja Tigers. The Stadium is approved by the Rugby Union Football Association and has an artificial grass surface and all are welcome, for further information contact Ian Baker on 650 892 044 or Glyn Horsfall on 617 357 259. Torrevieja Tigers have their training session on for three groups every Wednesday, Ladies, the under 12 years and the under 14 years. The training takes place at the Nelson Mandela Stadium, Avenida Delfina, Viudes, Torrevieja, home of the Torrevieja Tigers. The Stadium is approved by the Rugby Union Football Association and has an artificial grass surface. Training takes place between 1700 and 1900 hrs and all are welcome, for further information contact Ian Baker on 650 892 044 or Glyn Horsfall on 617 357 259. Torrevieja Tigers have their training session on for three groups every Thursday, the under 16 years and the under 18 years. 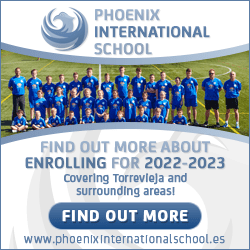 The training takes place at the Nelson Mandela Stadium, Avenida Delfina, Viudes, Torrevieja, home of the Torrevieja Tigers. The Stadium is approved by the Rugby Union Football Association and has an artificial grass surface. Training takes place between 1700 and 1900 hrs and all are welcome, for further information contact Ian Baker on 650 892 044 or Glyn Horsfall on 617 357 259. Torrevieja Tigers have their training session on for three groups every Friday, seniors between 1930 and 2100 hrs, the under 16 years and the under 18 years between 1830 and 2000 hrs. The training takes place at the Nelson Mandela Stadium, Avenida Delfina, Viudes, Torrevieja, home of the Torrevieja Tigers. The Stadium is approved by the Rugby Union Football Association, has an artificial grass surface and all are welcome, for further information contact Ian Baker on 650 892 044 or Glyn Horsfall on 617 357 259. Further details are also available through the excellent new website.